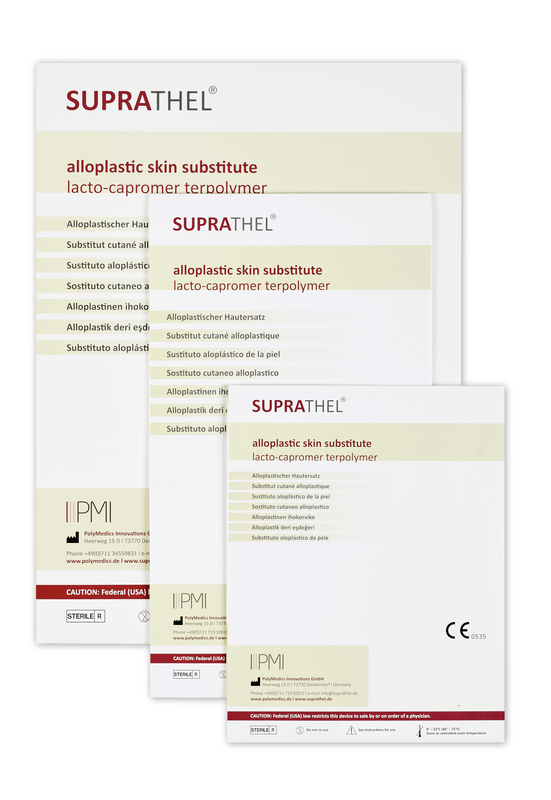 Suprathel alloplastic skin substitute for the treatment of wounds, split-skin donor sites and burns. SUPRATHEL® is an absorbable, microporous membrane and alloplastic skin substitute for the treatment of wounds, split-skin donor sites and burns. The SUPRATHEL® artificial wound and burn dressing as a thin elastic membrane adapts itself optimally to the surface of the wound and adheres on its own. SUPRATHEL® is only applied once onto the previously cleaned and disinfected wound where it remains until the wound is completely healed. After it is applied, the membrane becomes translucent and makes the inspection of the healing process possible. SUPRATHEL® can be removed easily from the healed skin parts without causing any pain. 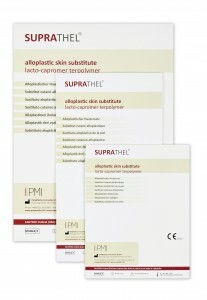 SUPRATHEL® is indicated in superficial and deep dermal/partial thickness burns and skin loss diseases. It is also successfully used in split-thickness skin graft donor sites, large scale abrasions, scar corrections as well as toxic epidermal necrolysis (TEN aka Lyell disease). SUPRATHEL® is purely synthetic and thus does not bear any residual biological risks.It is hydrolytically absorbed within 4-6 weeks. SUPRATHEL® was developed in a manner analogous to human skin and has properties comparable to natural skin such as elasticity, permeability to water vapour and impermeability to bacteria. The products of decomposition that are formed during the degradation of SUPRATHEL® stimulate wound healing by supporting angiogenesis and development of dermis. The acidification of the wound through SUPRATHEL® creates a wound milieu unfavourable for microorganisms and thus minimises the risk of infection. SUPRATHEL® can be used on any body area of adults and children. Due to its plasticity it can be moulded and is especially suitable for difficult-to-treat areas such as face, neck, hands and joints.